There’s no better classroom than real life. My kids started learning genetics in middle school. But they really already knew the basics. They figured out as young as 4 or 5 years old that Snowman the Delaware rooster was a docile, nonthreatening guardian of our mixed breed flock. And any roosters that the hens hatched that shared his solid white plummage and upright red comb were also calm and orderly. 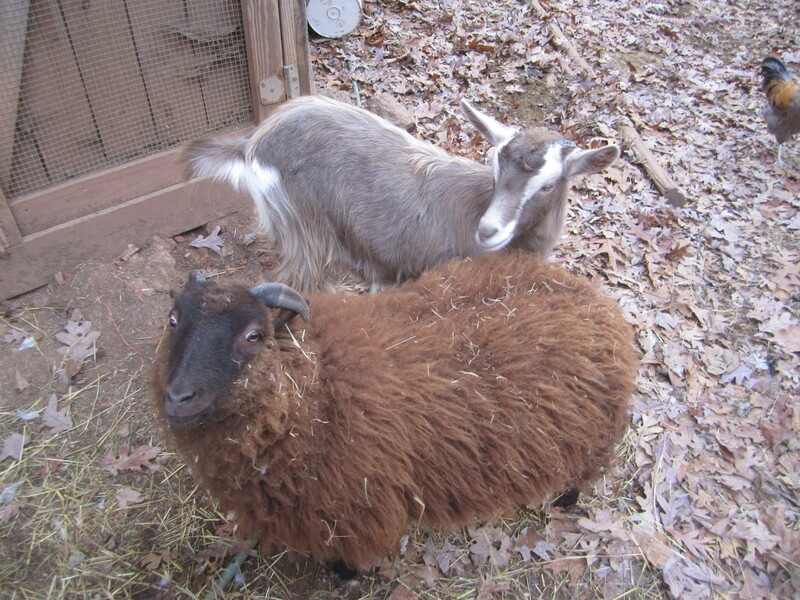 But add in some swaths of brown or black feathers, or change to a rose comb, and we often got a spurring machine ready to chase them across the pasture or thump them from behind as soon as they turned their backs. 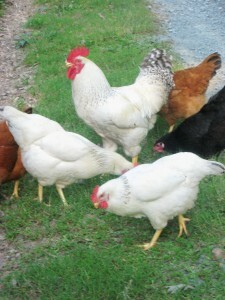 Although some of our mixed roosters were reliable, the good roosters always wore white. And the kids didn’t need a lesson in Mendel’s principle of segregation or a Punnett square to figure that out. 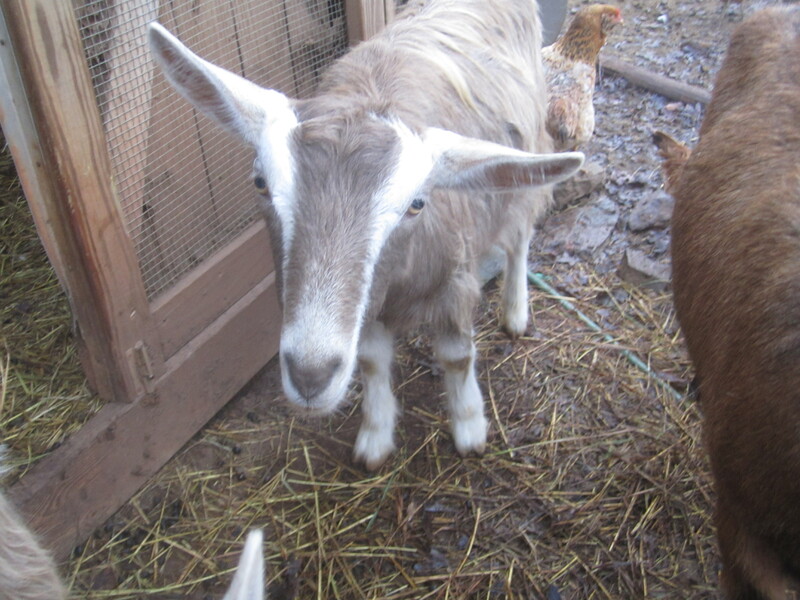 Once we added a polled buck to our horned herd, though, we did have to break out a pad and pencil. For the first time, we discussed recessive and dominant traits (polled is dominant) and we watched Merlin’s first few offspring carefully. 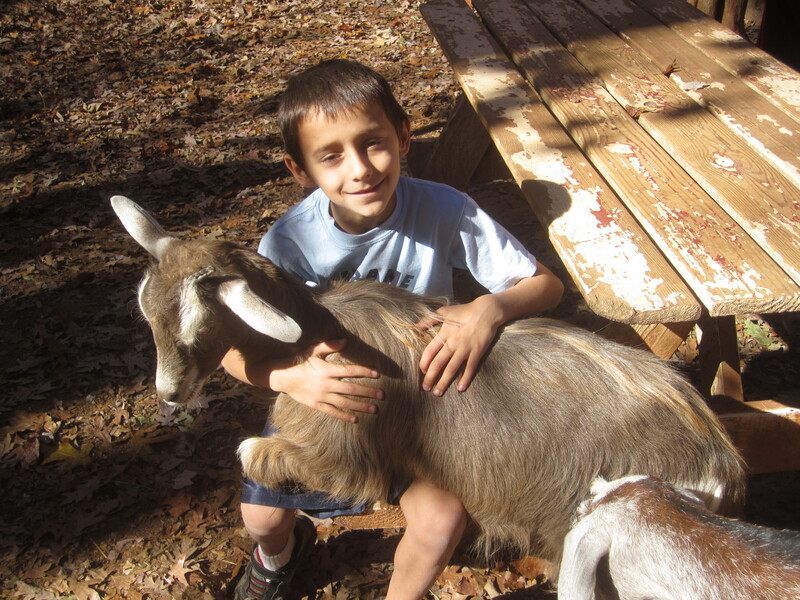 When he produced a mixed batch of polled and horned kids, we knew he must be heterozygous. Which meant fewer disbuddings, overall, but no reason to sell the disbudding iron on craiglist. Adding a blue-eyed buck and a blue-eyed doe to the herd was the next test of our genetic understanding. Blue eyes are also dominant so when blue-eyed Vixen was bred to a brown-eyed buck and produced a brown-eyed kid, we knew she was heterozygous. 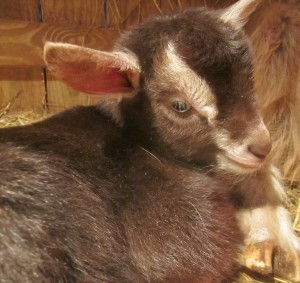 But our blue-eyed buck, TS, is another matter. So far this season he’s produced 2 kids, both with blue eyes, so there’s a possibility that he is homozygous. 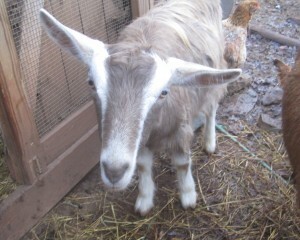 Unless he sired Angel’s little brown-eyed buck. Which we’ll never know. Because Angel has no respect for the concept of a control group in science. Way to go, Angel. So far, our experience with genetics was interesting and enlightening. Polled kids, blue eyes, easy going temperament, broodiness, milk production, aggression—there were a million ways in which we watched the dance of genetics play out on the farm stage. It was exciting and intriguing and then….it wasn’t. Because last night I went in to check on Tina after dinner and found her calmly eating out of her trough. 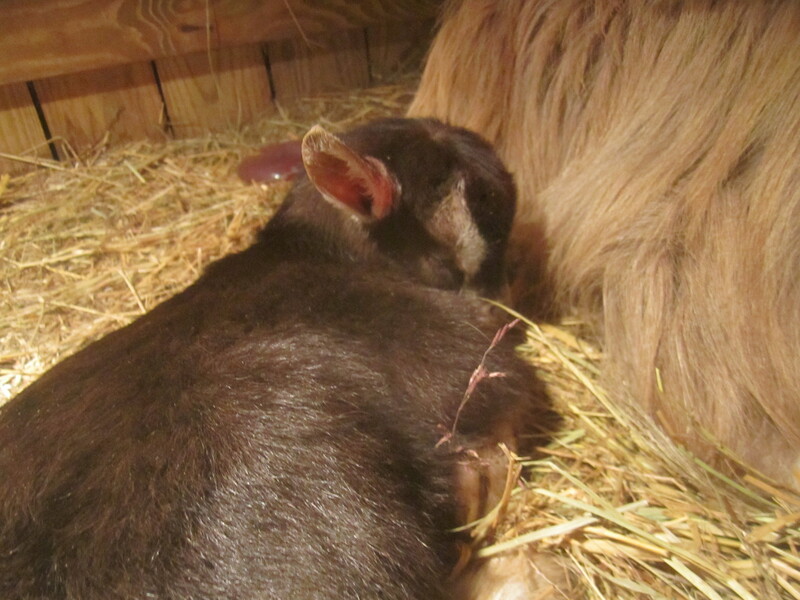 So calmly that I almost missed the dried and cleaned kid asleep in the hay. My heart leaped! 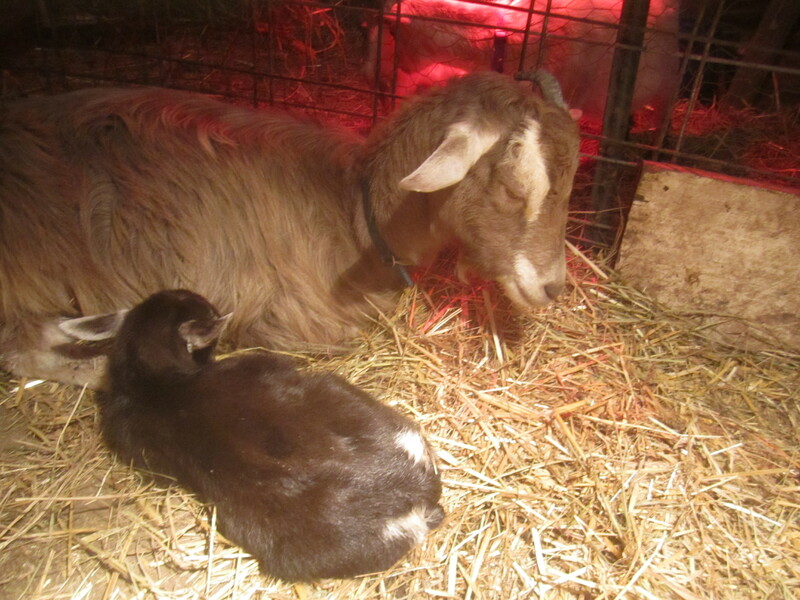 Not only did Tina successfully kid on her own, she had taken perfect care of her kid, she was already up and eating as if nothing had happened, and she had done it all in the 45 minutes since I checked her last! Ease of kidding is a highly desirable trait in a dairy goat and combined with her full-to-bursting udder that had already been in evidence for weeks, Tina was on her way to earning her spot in the herd. Pretty rushed out to see the newest arrival and our hearts melted when we saw his beautiful blue eyes. It was a trimuph. A victory. Until it wasn’t. Because when the kid was finally roused enough by our ooohing and aaahing to rise and seek a sip of milk, he “knuckled down” on both front pasterns as he walked. We gasped. It wasn’t exactly the same deformity that Tina had as a kid. Her front legs were characterized by extreme rigidity, a fierce C curve, and an inability to straighten them. If anything, this kid had weakness from the last joint down to the hoof. And that joint itself seemed enlarged or swollen. Unlike Tina when she was a kid, he could walk upright, but it was undoubtedly a defect. And there was no more claiming that Tina had been merely positioned wrong en utero. That her leg problems were the result of cramped space causing contracted tendons. It’s true that leg weakness is one of the most common problems in newborn kids. Joint ill ( or navel ill) can occur if bacteria travels through a wet umbilical cord and affects joints in the legs. White muscle disease from a selenium deficiency can cause leg weakness, too. 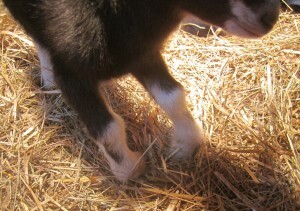 But this baby was born with weak legs, it didn’t occur after a few days of exposure to bacteria. 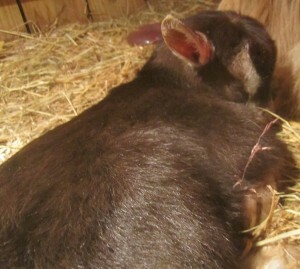 And Tina (like all our pregnant does) was well-dosed with selenium before she kidded to prevent white muscle disease. 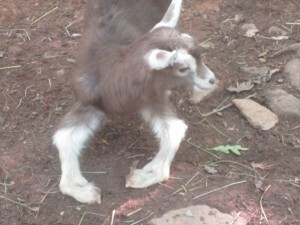 The truth is that we’ve never had a kid born with leg problems until Tina arrived. So there was no denying that this was a genetic defect. One that Tina was born with and that had now passed to her kid. That’s when genetics is no longer interesting or exciting. 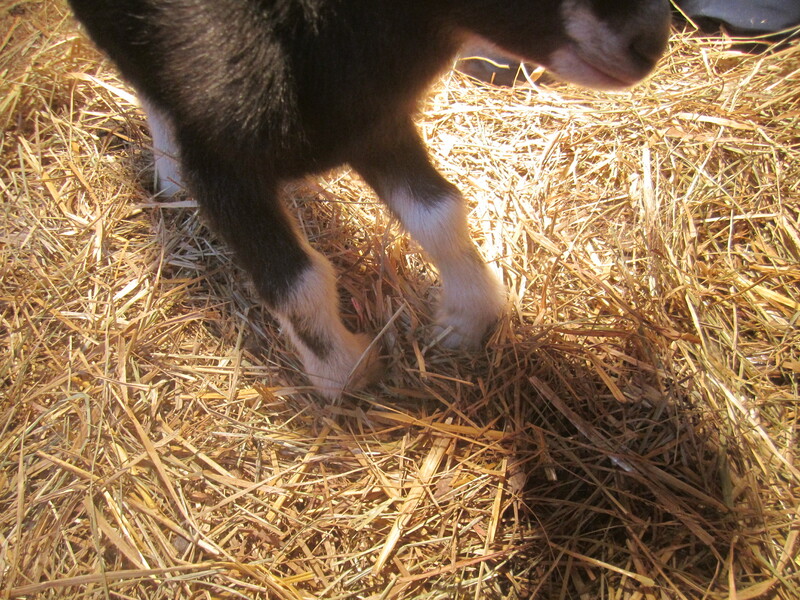 That’s when genetics makes you sigh, and give your goat a good chin scratch, and know she’ll never kid again. 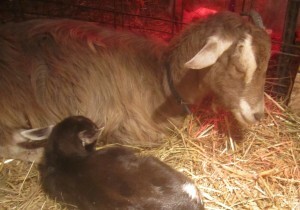 And her baby will be banded and sold as a pet goat or sold to the local flea market as a meat goat. But he won’t be allowed to breed and he won’t stay here. That’s when you look at Tina’s mother, Vanilla, and hope the bad genes aren’t carried by her. That perhaps her next kid will have perfect legs and the cycle of weak legs was all started by a random buck, that lives somewhere else and will never be bred to your does again. 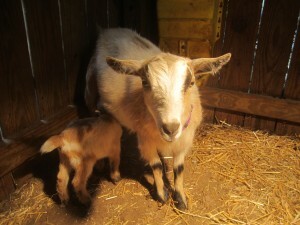 Since Vanilla arrived at her first owner’s place already bred, we don’t have any info on the buck that bred her. But we’re hoping he’s the one with gimpy genes. We won’t know anything until Vanilla kids again, sometime at the end of July. Which means she stays at least until then. And don’t worry, Tina fans! Tina recovered perfectly from kidding and has a lovely udder. She’s made a home for herself here, at the very least until she dries off. Since one of our goats is on her second year of milking through, we expect to do the same thing with Tina and it will be a long time before we have to make any decisions about her. But I doubt she’ll be going anywhere. Lap goats are hard to find, you know. Almost as hard to find as goat sheep. Good genes aren’t everything. Sometimes good hearts are enough. Oh, too bad about the baby. Just checking about the genetics. In humans, blue eyes are recessive and brown eyes are dominant. Is it the opposite for goats? 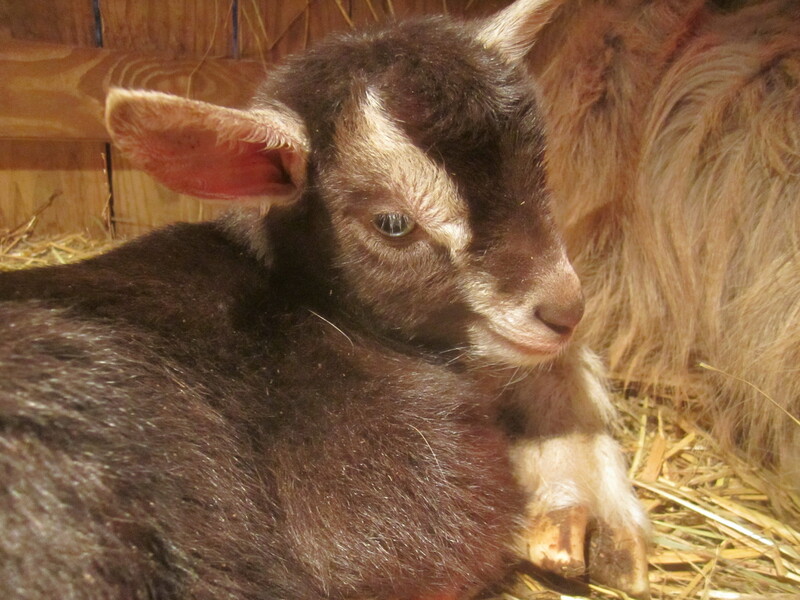 Yes, blue eyes are dominant in goats. 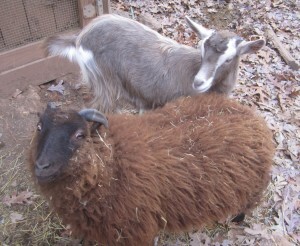 Which I always thought was weird b/c I see way more brown-eyed goats than blue-eyed. Go figure! Aw, crap. I’m sorry the little one has wonky legs. That made me sad. Although, I am really glad Tina delivered well and is okay in recovery. Poor gal. It’s sad that you can’t breed her anymore–she seems like such a sweet gal. I was worried about that. So Sorry, and sorrier still that you have to part with Tina and her baby… Farming can be tough on the heartstrings. Yay Tina for knowing just what to do, though, when kidding. And she’s a bit of the devil’s spawn to do it while you left her alone! lol. Good luck! Poor kid. I’m hoping that he’ll surprise you and will develop into a nice strong-legged buck and that it will all end up being a moot point.